Celebrating the life of Claude A. McKibben, Jr.
Be the first to share your favorite memory, photo or story of Claude. This memorial page is dedicated for family, friends and future generations to celebrate the life of their loved one. Obituary for Claude A. McKibben, Jr.
Claude A. McKibben, Jr., 70, of Hogansville, passed away, Saturday, March 30, 2019, at Hospice LaGrange. Mr. McKibben was born September 27, 1948, in Griffin, son of the late Claude Alexander McKibben and Sara Compton McKibben. A resident of Hogansville since 1949, he was a 1966 graduate of Hogansville High School, attended West Georgia College, and was a 1971 graduate of the Dallas Institute of Gupton-Jones College of Mortuary Science. He was a licensed funeral director and embalmer for 48 years and was a part of the family funeral home in Hogansville, along with his late father, his brother, and his nephews. 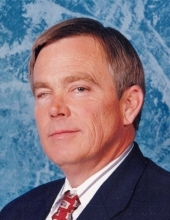 Throughout the years, Mr. McKibben was a member of a number of civic and business groups in Hogansville, Troup County, and on the state level. He was a member of the Georgia Funeral Directors Association, the National Funeral Directors Association, and was a past-president of the Academy of Graduate Embalmers of Georgia. Claude was an avid hunter and enjoyed being outdoors. Wednesday was Claude’s day to serve as a gentleman farmer, either helping friends on their property or spending time on his own property. He also enjoyed attending state and national conventions and had many funeral service friends across the country. Claude was preceded in death by his son, Corey Allen McKibben and is survived by his brother and sister in-law, John and Eve McKibben; nephews, David and Suzi McKibben and Patrick McKibben, all of Hogansville; niece, Sarah and Thomas Carmine of Houston, TX; and great-nephews, Daniel, Alex, John and Luke. Claude was also preceded in death by his former wife and best friend, Yvonne McKibben, and is survived by Yvonne’s daughter, Michelle Gregor and her children, Emory, Amberleigh, and Aaron. He is also survived by Rae Eason, his first wife and the mother of Corey. The funeral service will be conducted at 11:30 a.m., Tuesday, April 2, in the Chapel of Claude A. McKibben and Sons Funeral Home in Hogansville. The Reverend Harrison Cain and Mr. Kenny Coggins will officiate and interment will be in Myrtle Hill Cemetery. The family will receive friends at the funeral home from 6 until 9 Monday night. Flowers are welcomed; however, Claude was a long-time supporter and had great respect for the work done by the Pineland Campus of the Georgia Sheriff’s Youth Homes and memorial contributions to Pineland would also be welcomed. To send flowers or a remembrance gift to the family of Claude A. McKibben, Jr., please visit our Tribute Store. "Email Address" would like to share the life celebration of Claude A. McKibben, Jr.. Click on the "link" to go to share a favorite memory or leave a condolence message for the family.